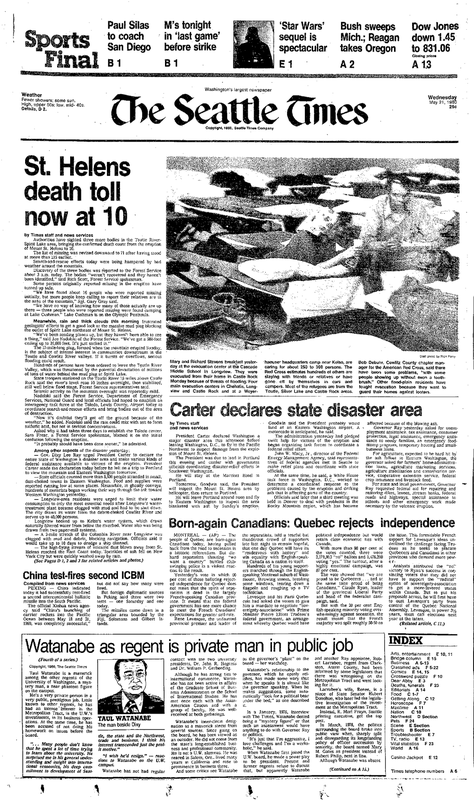 The eruption of Mount St. Helens killed 57 people and blanketed parts of the Pacific Northwest in ashen darkness. In May 1980, Mount St. Helens erupted, killing 57 people and leaving the landscape forever scarred. Fish were seared in nearby streams as hot mud flowed down the mountain slope. Trees were stripped and piled like matchsticks by the blast. 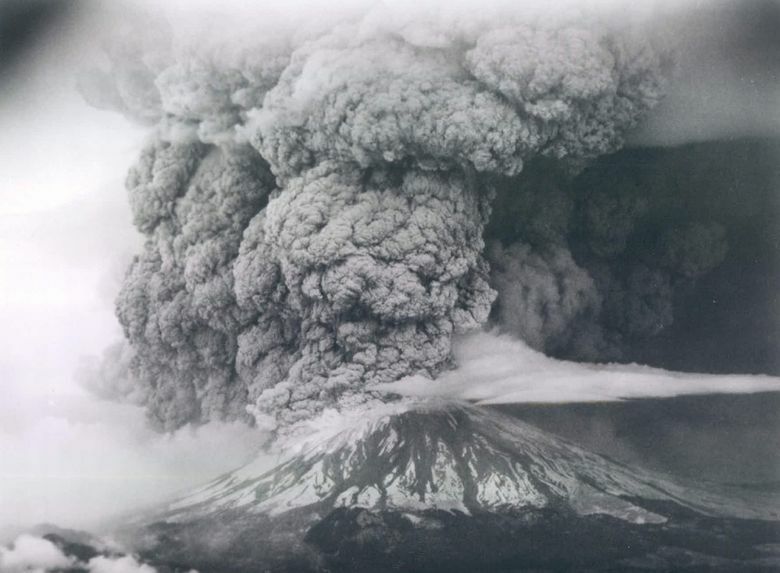 Ash blanketed Washington and was transported across the United States. 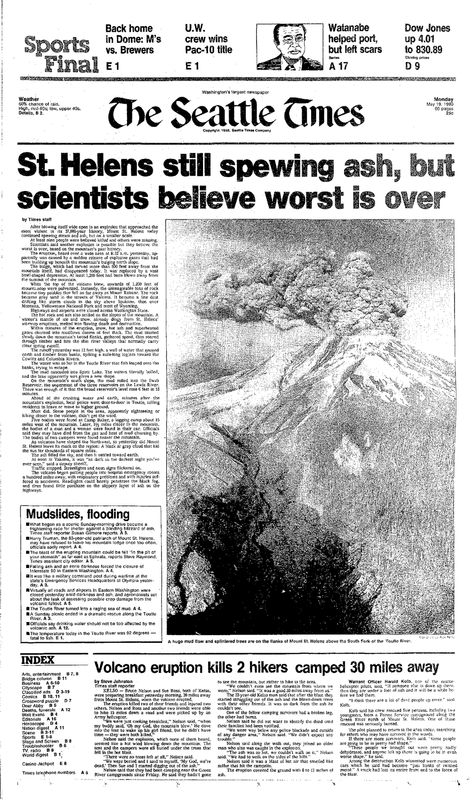 “In the spring of 1980, the volcano burped to life two months before the actual eruption, and we had sent reporters to the area, on and off, for weeks, anticipating an eruption. We envisioned perhaps a river of lava, or maybe some pyrotechnics. Nothing prepared us for the blast that killed 57 people, blew away the mountain’s top 1,300 feet and sent an ash plume around the globe. 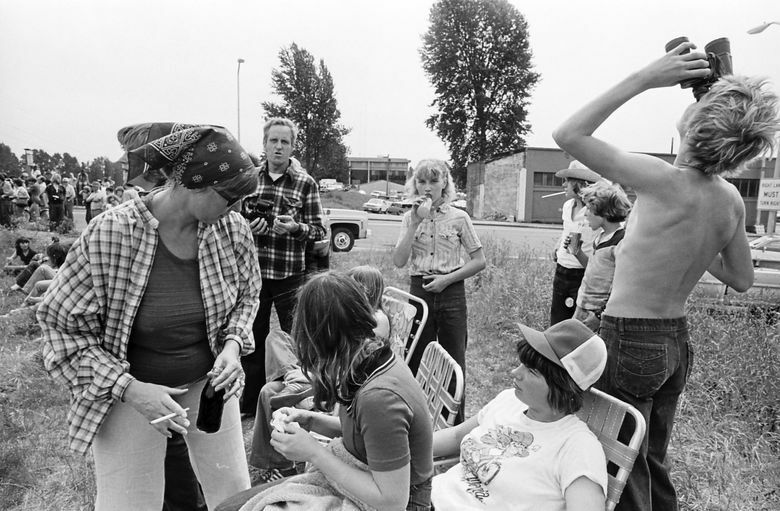 On that Sunday morning, May 18, I was called at home and headed to Boeing Field where Times photographer Ann Yow and I climbed into a plane the newspaper had chartered in advance. A second plane carried another Seattle Times crew: [reporter Steve] Johnston and photographer Rick Perry. As soon as we gained elevation, we could see a black wall across the sky in the distance. As we approached, we saw that the lower right-hand corner of the wall was the volcano. A billowing column of smoke and ash continued to stream skyward, containing jagged streaks of lightning, as if nature wanted to highlight its powerful display with exclamation points. Years later, the volcano still demands attention and gives cause for excitement (and some anxiety, too). In 2004, it began spilling magma once again, forming a growing dome in its crater. 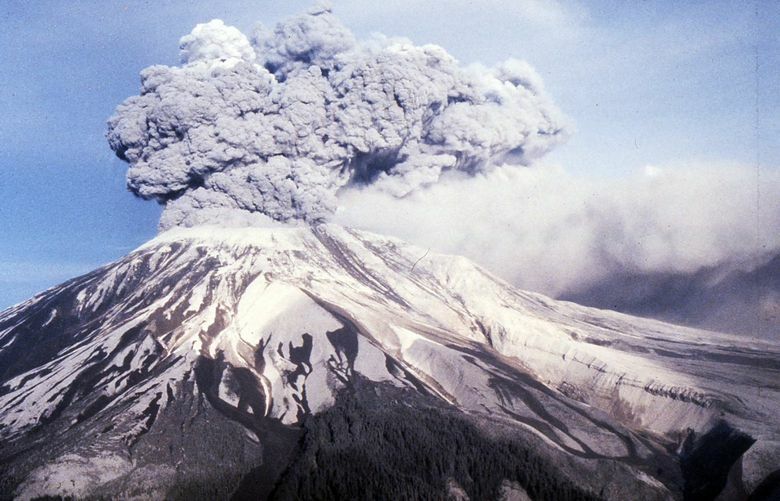 Mount St. Helens now hosts the world’s youngest glacier, which sits protected in a horseshoe-shaped shell where the mountain burst. Earlier this year, hundreds of small earthquakes shook the volcano, recharging for its next eruption, which could be decades in the future. 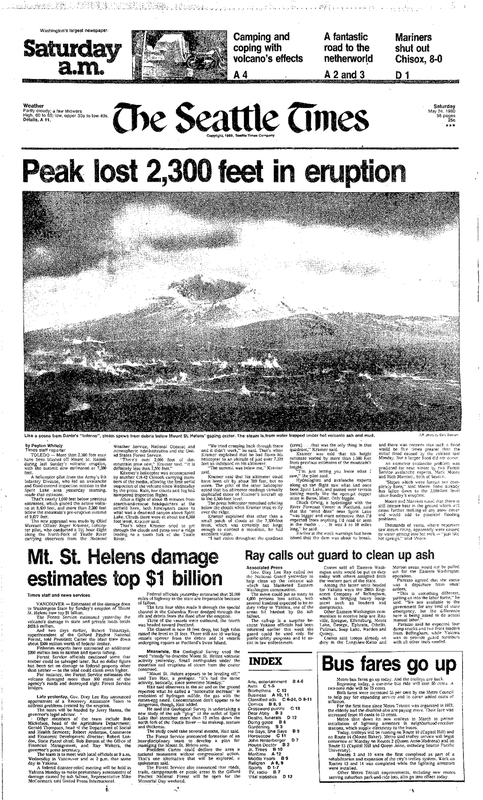 In Spirit Lake, “the waters literally boiled” after “at least 1,200 feet had been blown away from the summit” of Mount St. Helens. Ash drifts all the way to Wyoming. Nine people are reported killed after the blast, but scientists do not foresee more major volcanic activity. Nearly 100 people are reported missing and scientists are concerned that Spirit Lake might overflow a mud dam and cause flooding downstream. Aerial observations show Spirit Lake is forming a new shape. 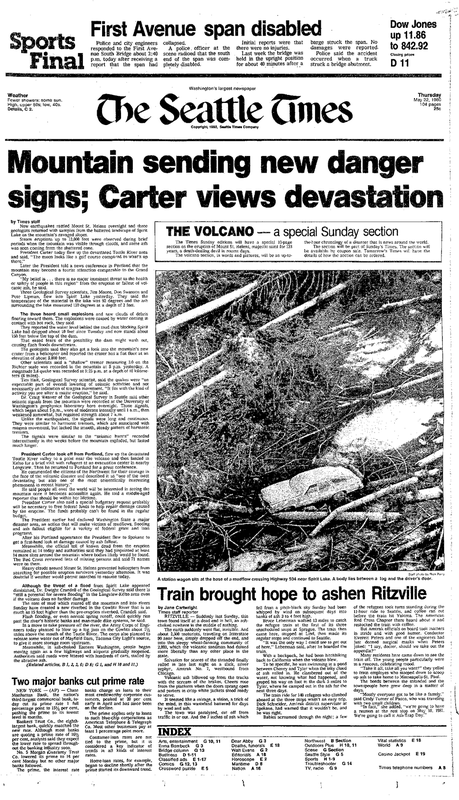 President Jimmy Carter declares the state of Washington a disaster area. Hundreds of people are ordered to leave river valleys near Mount St. Helens as water levels rise behind a mud plug on Spirit Lake. Thousands of people are stranded in “dust-choked towns in Eastern Washington” where food and supplies are running low. Volcanic dust reportedly reaches as far as New York City. President Carter flies over the Toutle River area. “The moon looks like a golf course compared to what’s up there,” he tells The Seattle Times. Fears of flooding diminish as water levels begin to drop behind the mud dam on Spirit Lake. Highways closed by ash gradually begin to reopen. 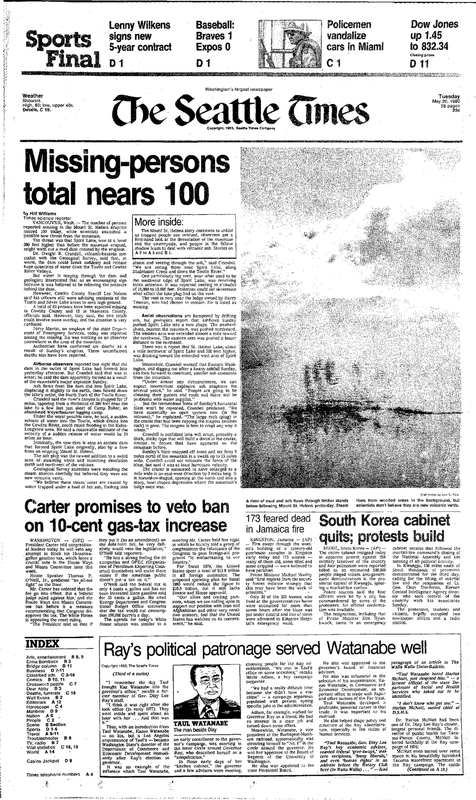 The death toll hits 17, as search-and-rescue missions scour the area for survivors and to recover bodies. Officials say some people were likely incinerated and will never be found. A dog is found alive near the body of its owner. 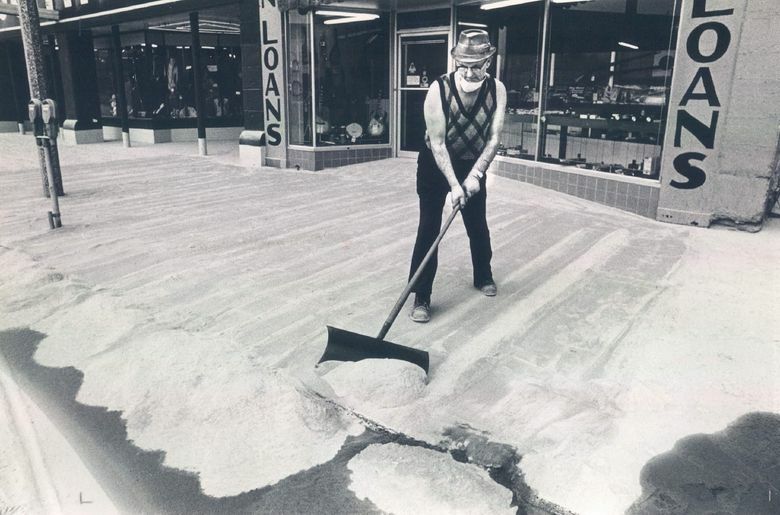 President Carter declares Idaho a disaster area because of volcanic ash covering the state. Damages are estimated at more than $1 billion, and more than 500 miles of Forest Service roads are damaged. 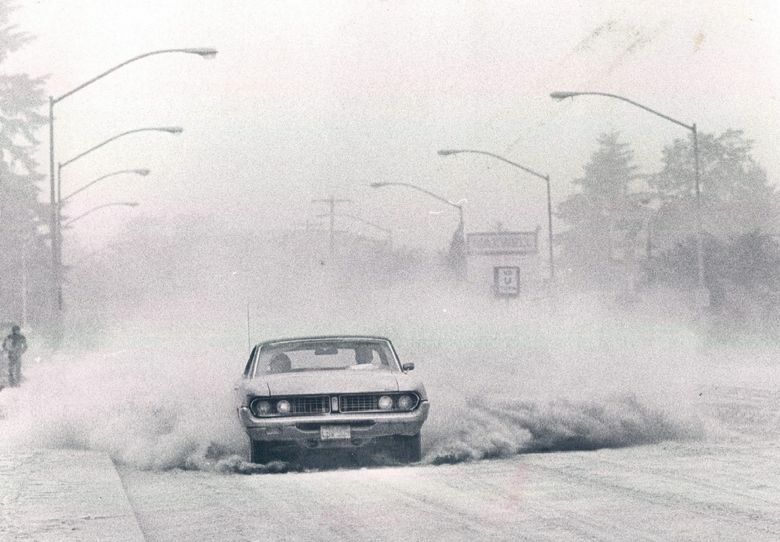 Officials estimated 26,000 miles of highway in Washington state are not passable because of ash fallout. Gov. Dixy Lee Ray asks the National Guard to help clean up the ashen mess. 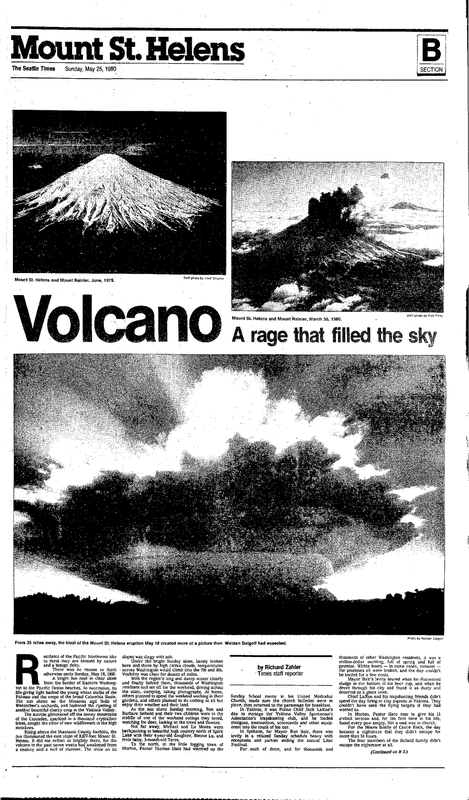 The Seattle Times prints a special section about the eruption, describing terror and heartache after the volcano exploded and consumed the state with darkness. “Residents of the Pacific Northwest like to think they are blessed by nature and a benign deity. 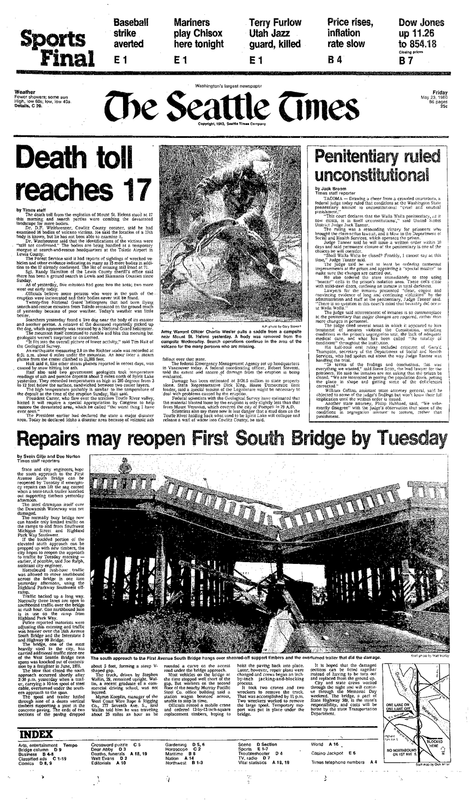 There was no reason to think otherwise early Sunday, May 18, 1980. A bright sun rose in the clear skies from the border of Eastern Washington to the Pacific Ocean beaches. In succession, its life-giving light bathed the young wheat stalks of the Palouse and the crops of the broad Columbia Basin. The sun shone on the blossoms and buds of Wenatchee’s orchards, and hastened the ripening of a bountiful cherry crop in the Yakima Valley. 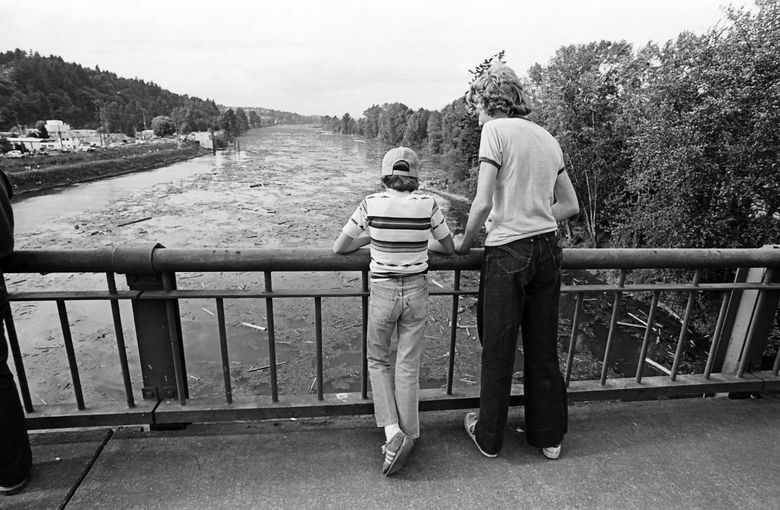 “Until two months ago, in the memory of every living person, Mount St. Helens, shimmering across Spirit Lake, stood as a ready symbol of benign and beautiful nature in the Pacific Northwest.